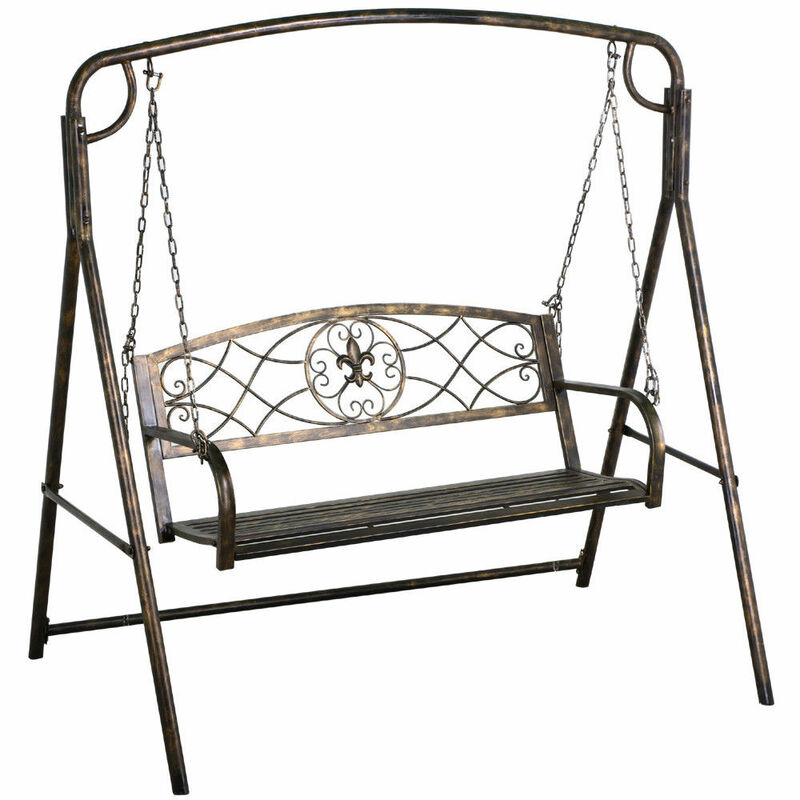 Place your porch swing to the place of your choice with one of these 7 Swing Stands. Let’s take a look at the main features, pros and cons. This rustic wooden patio swing stand is made of Northern White Cedar, which offers lots of construction and aesthetic benefits. The mount features an A-frame design. 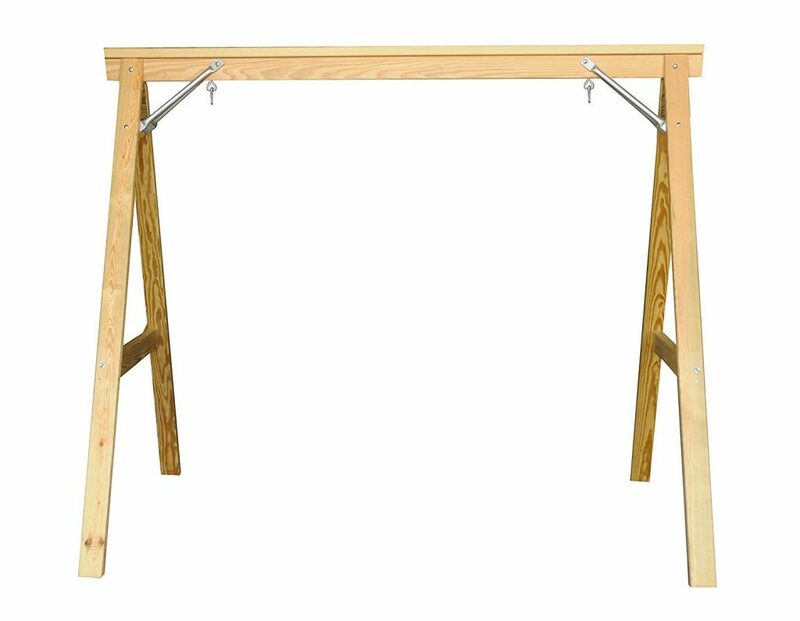 This Lakeland Mills frame mount can handle swings of up to 5 feet and weights of up to 600 pounds. Might take more than one person to set it up; though the assembling instructions are easy to follow. The cracks (checks) might not hold any aesthetic appeal for some people. If you want a swing that will give you quality performance without costing you much, this Lakeland Mills stand is cheaper than the Kingpatiofurtniture, Hatteras, and South Mission alternatives reviewed here. The frame is very strong and sturdy, and it can handle lots of weight, which makes it a worthwhile purchase. Combine this rustic stand with the cedar porch swing and you have outdoor log furniture that will last for years to come. 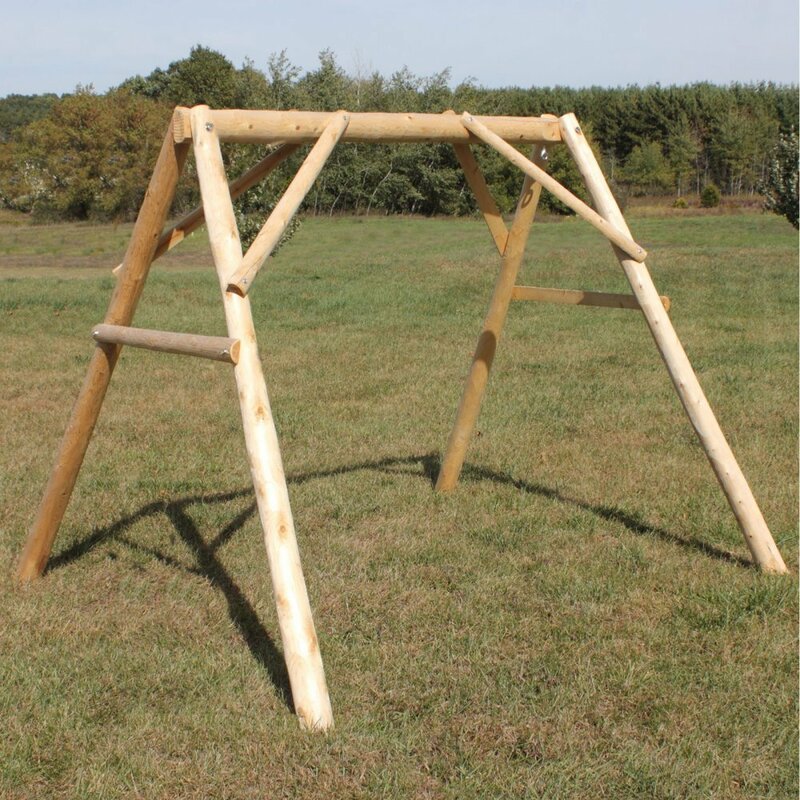 The A-frame swing mount is made of choice yellow pine. It is also stabilized using zinc coated fasteners. The mount weighs 63 pounds and measures 73x83x53 inches. These measurements mean that the swing can be used for 4 feet swings. If you are shopping for a wooden patio swing stand on a limited budget, this is clearly a better alternative to the Hatteras and the South Mission models reviewed here. And if you are not crazy about the rugged natural rustic look of the Lakeland Mills stand, then this is the frame for you. It is strong and worth every penny. The frame mount is made of natural cypress, and over time this color changes to light silver. The frame is 7.5 feet wide and 7 feet tall, and it can support weights of up to 450 pounds. An award-winning swing stand has won the international “Design Excellence Award” in 1990 and according to the manufacturer is most widely copied hammock stand around. The wood has been bent using steam to come up with this truly unique arc design. The beams are also glued together to make stronger single beams that add to the inherent strength and stability of the cypress frame. The construction quality, design and other features make this wooden patio swing stand a worthwhile purchase. In terms of design, it is more desirable than other swing stands reviewed above. Whatever the case, you will get real value for your money with this purchase. This A-mount swing is made of real cypress wood, and it can be used with single and double-sized hammock chairs. The frame is made of 5 layers of dry cypress wood, which makes it stronger and more durable. For this reason, the frame can handle weights of up to 450 pounds. The frame measures 78x60x82 inches. The unique design is also charming, despite being simple. The frame’s unique color also makes it capable of complementing its settings whether you are using it for your house, cabin or backyard. 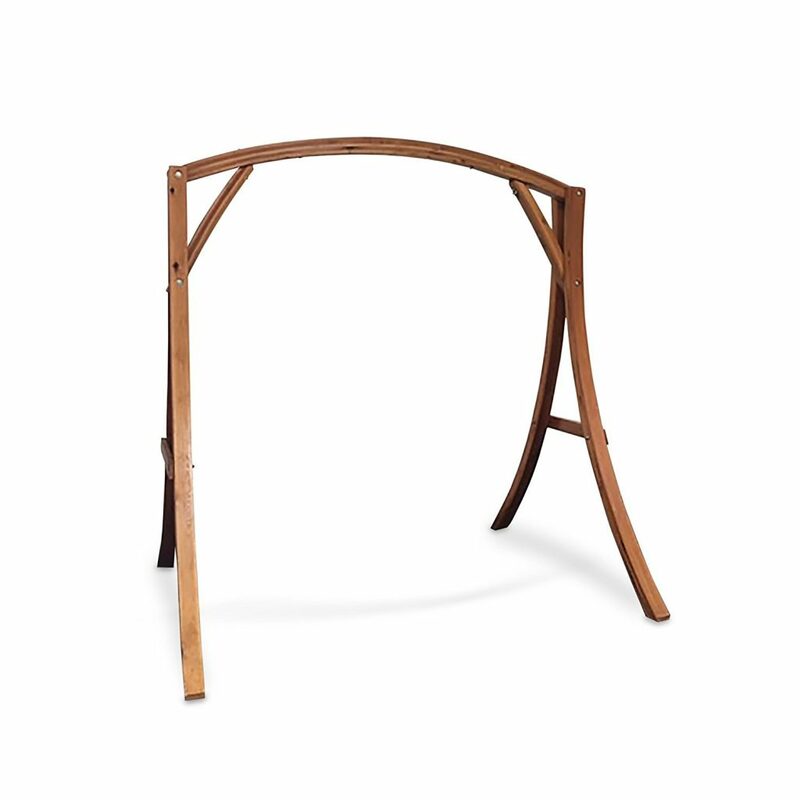 This wooden arch frame mount is certainly worth buying – it offers real value for money. It will be especially appealing to people who need a frame mount that looks good; unlike the plain Kingpatiofurniture and the rustic Lakeland Mills swing mount. Furthermore, the frame is cheaper compared to the cypress Hatteras Hammock stand. 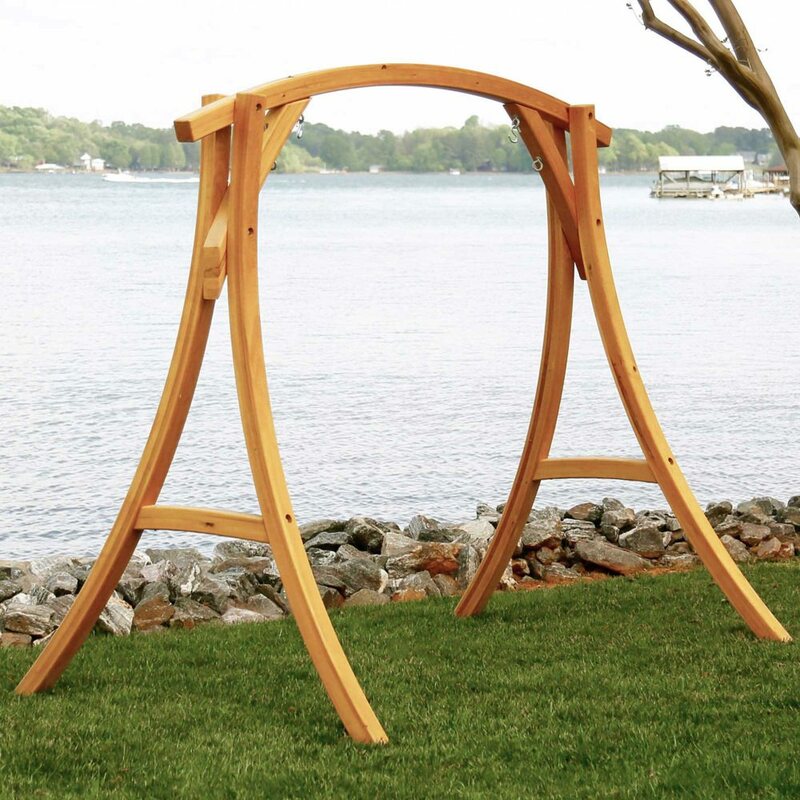 The Yaheetech Iron A-Frame Porch Swing Stand is a compact swing stand that measures 69 by 48 by 72 inches (LxWxH). It also has a weight capacity of around 441 pounds. The Yaheetech Iron A-Frame also features iron frames with glossy oil surfaces and includes a supporting back plate for increased stability. Its simple spray powder paint coating can’t protect it from harsh weather, but if you can put this swing set in a secure location then it will last for a long time. The best thing about the Yaheetech Iron A-Frame Porch Swing Stand is that it is easy to put together. It’s easy to assemble and disassemble on a moment’s notice, which is why, compared to the SWSLBK and the Hatteras, it’s very convenient for children’s parties and other similar events. It’s also quite sturdy and durable, though not as tough the SWSLBK. With regards to price, it’s very affordable, but don’t expect any special features either. This swing stand is best for parents who prefer simple but dependable swing stands. 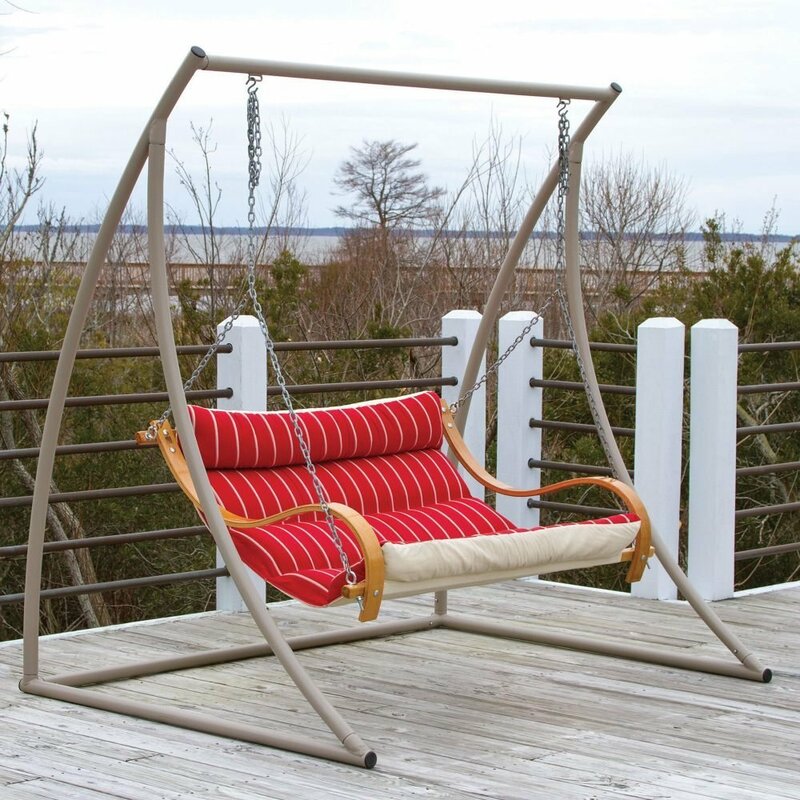 The Hatteras Hammocks Extra Wide Metal Swing Stand is a stylish stand that features a curved modernist design. It is 6 ft. 6 in. high and 5 ft. wide, and it has a weight capacity of around 450 pounds. 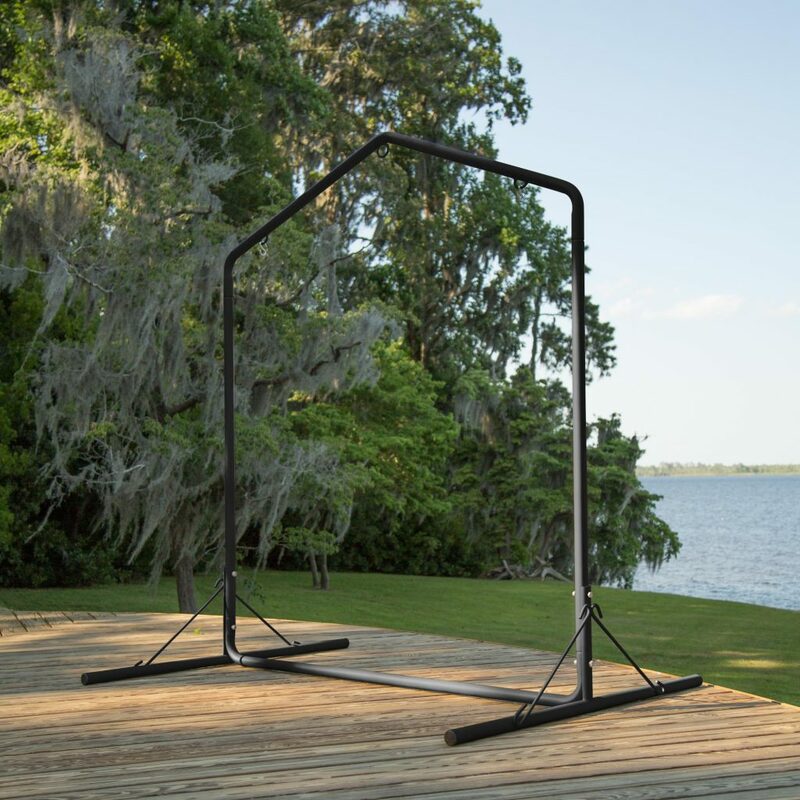 The Hatteras Hammock Swing Stand’s poles can be slid together to make tight connections, and additional bolts can be installed into its various parts for increased stability. For protection, the stand is coated using the Cape Shield process to make resistant to harsh weather. Textured powder-coating is also carefully controlled to make the swing stand weather-resistant. The Hatteras Hammocks Extra Wide Metal Swing Stand is a sturdy item that looks good on any patio or backyard. Compared to the Yaheetech Iron A-Frame and the SWSLBK, this swing stand looks aesthetically pleasing. It’s the kind of swing stand that you’d be proud to show off to people nearby. More importantly, it doesn’t take up a lot of space, which is a good thing for homeowners who don’t have large backyards. On the other hand, assembling the Hatteras Hammock Swing Stand requires time, and if you get it wrong, the whole set will feel a little wobbly. All in all, you should only buy this swing stand if you want a stylish swing set that matches your home’s decor. It’s definitely not a cheap item, but if aesthetics and space are priorities then this is one of the best options around. The Pawley’s Island SWSLBK Steel Swing Stand is a tough, sturdy swing set made from heavy duty steel. It measures 87 in height and 77.5 inches in width, and has a weight capacity of around 450 pounds. The SWSLBK’s main components are 12 gauge poles with 2-inch diameters, which are compatible with Pawley’s single and double swings. These items are not only easy to assemble, their cape shield coating can also protect them from harsh weather. The best thing about the Pawley’s Island SWSLBK Steel Swing Stand is its sturdiness. It can take the worst punishment children can give it. And like the Yaheetech Iron A-Frame, it’s easy to assemble and can be deployed in any part of an average sized yard. The only flaw with this swing stand is that it is expensive, but if you’re prepared to spend the cash then it will give you and your children several hours of fun. The SWSLBK is tough, reliable and it can handle a lot of weight. Combine one of these swings with the patio swing of your choice, hop on, sway for a bit, and enjoy the swinging into a stress-free zone.